Here is the magnificent Largillière portrait of Voltaire in the Versailles collection, prominently rehung in the Salle du Pape in January following the Charlie Hebdo shootings. Shame that it should ever have been hidden away! Even though the painting is so well known, there is a certain amount of mystery surrounding it. The problem is that there are actually two Largillière portraits, this one in Versailles and one in the Musée Carnavalet, both of which have good claim to be the "original". The prima facie case for the Versailles portrait is a strong one. It is clearly the superior painting in finish and coloration, and has the endorsement of Largillière experts such as Dominique Brême, who wrote the catalogue for the major Largillière exhibition at the Musée Jacquemart-André in 2003. But the Carnavalet portrait too has a well-established provenance. beautiful Suzanne looks on adoringly. 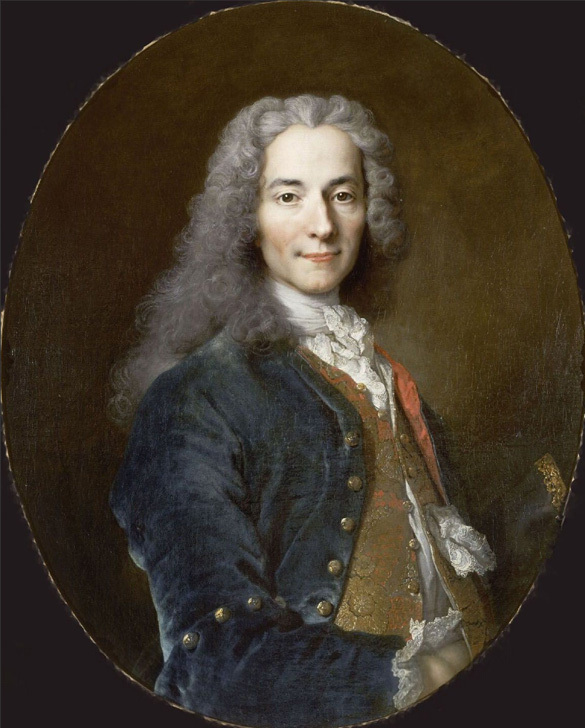 The only early reference to the portrait is a note in the Kehl edition of the works of Voltaire relating to the Epistle Les tu et les vous which was written in about 1729 and probably addressed to Voltaire's former lover Suzanne de Corsembleu de Livry, marquise de Gouvernet. Long ago in 1716, whilst in exile at the Hôtel de Sully, Voltaire had struck up a relationship with the beautiful aspiring actress. Despite Voltaire's voice coaching she failed to excel on the stage, even when Voltaire secured for her the leading role of Jocasta in Oedipe. She subsequently travelled with a troupe of actors to England, acquired an aristocratic husband the marquis de Gouvernet, and, with Voltaire's aid, won a fortune on the lottery. 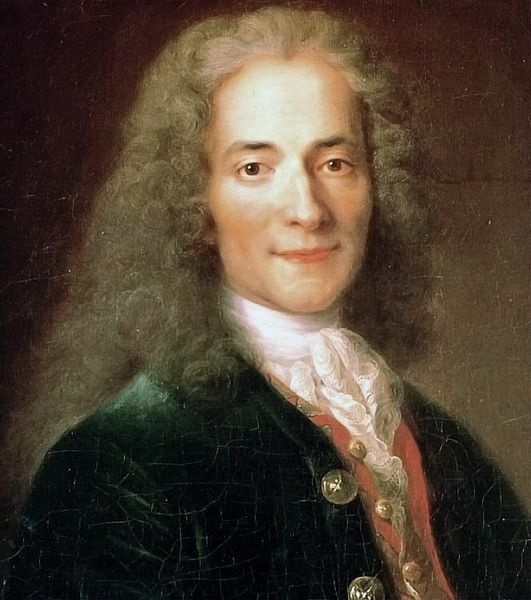 In 1729 Voltaire was not amused when he found himself turned away from her door by a lackey. A lifetime later in 1778, during Voltaire's final months in Paris, the former lovers, now both octogenarians, met once again. 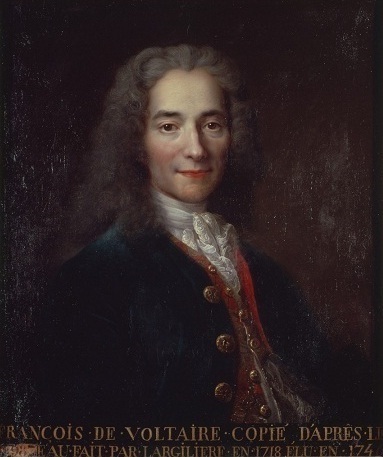 Voltaire discovered that she still possessed his portrait. "At the time of his liaison with mademoiselle de Livri, M. de Voltaire had given her his portrait, painted by Largillière, and she had kept it always despite their parting, her change of estate and her religious devotion. During their conversation in 1778, he let it be known that he wanted to offer this portrait to the marquise de Villette; madame de Gouvernet consented, and Voltaire immediately carried it off personally to madame de Villette, who has possessed it ever since." The picture was sold as part of the Villette collection in 1865. No other copy of the work was known to 19th century commentators. 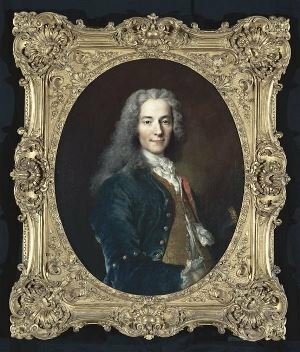 Critics often complained that, since this picture was in private hands, no good quality portrait of Voltaire was accessible to the public. 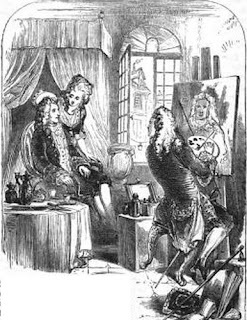 There was only an inferior copy prepared for the Académie française. This still exists at Versailles; the details of Voltaire's dress - notably the red waistcoat and arrangement of buttons - show clearly that it derives from the Carnavalet portrait. What about the Versailles Largillière? We know that it belonged to Massimo Uleri - presumably the film producer - who donated it to the Versailles collections in 1962. Squinting at "snippet view" of the 2003 Largillière exhibition catalogue yields the information that this portrait too is identified as the picture given to Suzanne de Livry. The earliest entry in the detailed provenance refers to the collection Evrard de Rhoné, which was the subject of a sale in Paris, hôtel Drouot, on 6-8 May 1861. (I even found a sale catalogue on Internet Archive but, disappointingly, there is no mention of the Voltaire.). The portrait subsequently belonged to several other collectors and was sold to M. Uleri in December 1961. "The existence of the version in Versailles, which is of better quality, has cast doubt on the authenticity of the portrait in the Carnavalet. According to the research of Samuel Taylor, the portrait in the Carnavalet is indeed the original, and the portrait in Versailles, is a copy ordered by Voltaire from the artist in about 1740. The difference in quality may be explained by Voltaire's fame - by 1740 Largillière was painting the most famous author in Europe." Samuel Taylor is presumably Samuel S.B. Taylor, who has written extensively on both Voltaire and Rousseau. So far I haven't traced the reference. However, there is clearly no absolute consensus among the experts. It might be worth pointing out that we do not really know if the portrait given to Mlle de Livry was the "original" or the only one in circulation in the 1720s; would Voltaire really have surrendered the only copy to his mistress (or even ex-mistress), I wonder? Voltaire (1694-1778) vers 1728. Le modèle coiffé d'une perruque, revêt un gilet, un jabot et un habit orné de larges boutons. Au revers de la toile : "Fr de Voltaire, peint par Largillierre en 1728, donné à la marquise de Villette en 1778". L'existence de la version de Versailles, de plus belle qualité, a fait douter de l'authenticité du portrait du musée Carnavalet, dont l'historique est pourtant assez sûr. D'après les recherches de Samuel Taylor, il semble que le tableau de Carnavalet soit bien l'original et que le tableau de Versailles soit une réplique autographe, demandée par Voltaire à l'artiste vers 1740. La différence de qualité peut s'expliquer par la plus grande notoriété du modèle en 1740 : Largillierre aurait alors pris plus de soin à représenter le plus célèbre écrivain de toute l'Europe qu'il n'en avait pris, vers 1720, à représenter un auteur encore à ses débuts.